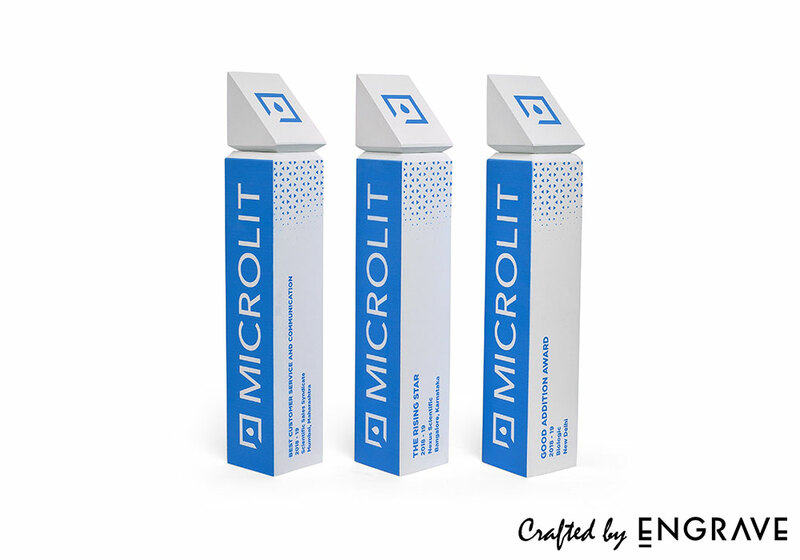 Microlit is a manufacturer of precision lab instruments. They are the market leaders in this space. They are also one of our most valued clients. Every year, Microlit entrusts us with the task of creating mementos for their annual gathering. This year was no different. At their annual dealer meet, they asked us to handcraft showpieces to be handed out to all the attendees, and additional trophies for star performers. Needless to say, they wanted everything to be showcase-worthy and done in double quick time. To begin with, we explored different design directions. Soon, we came up with the idea of a layered clock in wood and acrylic. We had to create 100 such pieces. The deadline was tight. We were up to the challenge. In addition to the clocks, we handcrafted trophies for the best dealers. These, too, we personalized in the logo colours of Microlit. You are cordially invited to take a good look at all handiwork. The images are attached. We believe we have the skills and attitude to create high quality merchandise, trophies, awards, certificates, and other keepsakes for your employees, business partners, and other stakeholders. What’s more, the corporate awards and gifting segment is flooded with mass-produced options. This is not a problem you will ever encounter at ‘Engrave - Awards & More’. Our ideas and creations are always unique. An in-house design and manufacturing set-up allows us to service larger orders faster and more efficiently. Oh, and one more thing, at Engrave Awards & More, satisfaction just isn't good enough. Either you love it or we'll make it right — guaranteed.